Today I will take you with me to Tajikistan, or to be more precise to the beautiful world of their traditional wear. If being honest, I know very little about this country and had never seen their traditional wear before, but I felt in love straight away! You will now see why. The Republic of Tajikistan is a relatively new republic, established on 9 September 1991, when the Soviet Union disintegrated. It is situated in Central Asia and has an estimated population of 8.7 million people. A very distinct characteristic of the country is that mountains cover more than 90% of Tajikistan and more than 50 percent of its land is over 3,000 meters (9,800 feet) above sea level. The official language of Tajikistan is Tajik, although Russian is routinely used in business and communication. 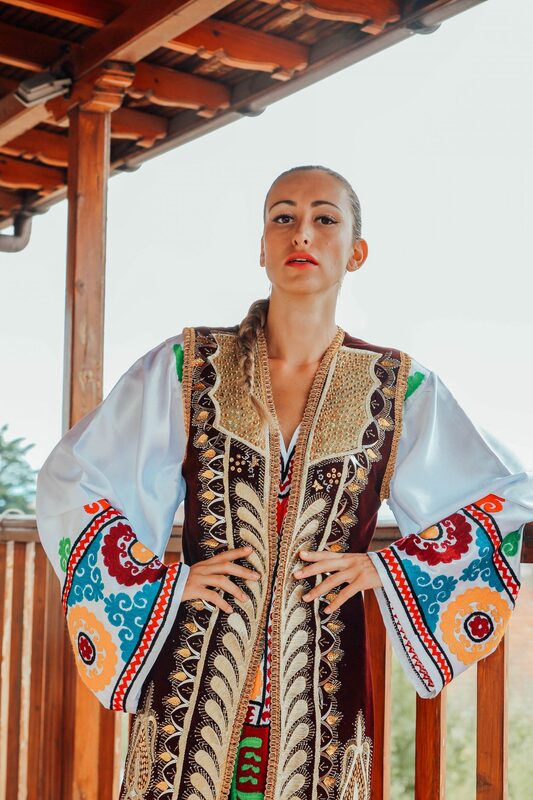 Tajik traditional clothes differ from region to region in terms of color, embroidered patterns, style. But there are some common features in every national costume. The most common traditional garment for women is a straight dress, widening at the bottom, worn over trousers. 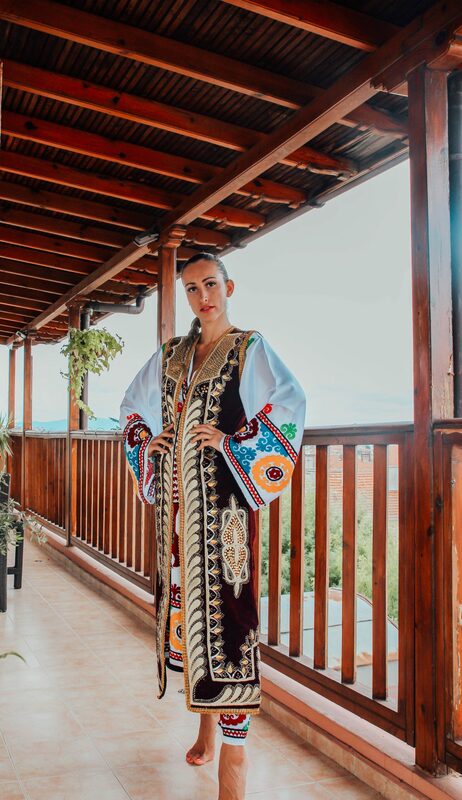 The traditional dress of the Tajik women is long shapeless attire prepared with brilliant and showy color patterns along with the matching pants. The dress is usually accompanied with embroidered traditional shoes. Some women also use Scarf or Hijab in order to cover their head or neck. Normally women wear only one dress at a time, however, on festive occasions they can wear as many as seven, with sleeves of graduated lengths to permit the embroidered ends of all to show. What I am wearing here is a festive dress with a very rich decoration. It is completely handmade and is only used for very important celebrations such as weddings. As a fan of gold, I cannot explain how impressed I am with the decoration of the top layer. It is a total masterpiece, don´t you think? The mountains and lakes are the best natural sights of Tajikistan. Lake Iskanderkul is one of the most striking sites in Tajikistan. The most important meal is the dinner. Tajiks eat sitting on a sufa around a low table – dastarkhan. The dinner begins with tea. Tea is drunk only from pialahs which are brought in on trays. A tray with sweets, fruit, and flat cakes is brought separately. After that they serve big pialahs with soup, and on bigger round dishes with main courses. Vegetable salads are served on plates. A dinner there is to be started by a senior family member then the others may join the meal. Tajikistan created a law to limit the number of people one can invite to a party (like a wedding) based on the household income in an effort to keep people from bankrupting themselves. Rural people depend almost entirely on what they produce themselves. Seventy-five percent of households grow food for their own use, and people in the cities plant gardens in vacant lots. The honeymoon in Tajikistan lasts 40 days! and the whole of the 40 days is spent under the same roof as the husband’s parents in order to protect the bride and groom at the start of the married life. 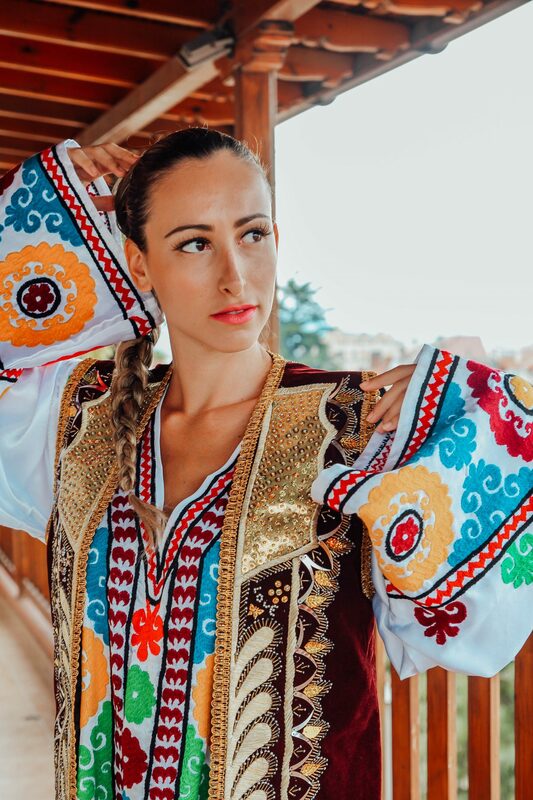 I hope you have enjoyed this post and we all know a little bit more about Tajikistan and their traditional wear. Lol you look fantastic, did not know much about the country, so was great to read your post! !